Hey there! 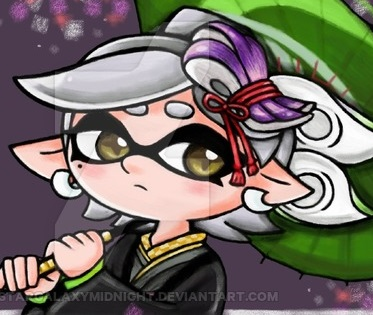 This request was a long time coming but I finally did it! Luigi64DD requested for his OC to be done, so I went right ahead and did it, all of the following process in just a span of 4 hours of 3DS Max horsepower. He has notified me that an N64 era-styled Luigi may not exist in 3D format and only as artwork but luckily here, Super Smash Bros. Melee was the saving grace, providing a Luigi very similar in the style Luigi64DD was hoping for. So, I downloaded the model off The Models Resource and retouched much of the model (especially the single texture variant of the model, had pretty bad uv editing so I tried fixing it), such as combining meshes together and welding their vertices, as well as averaging the normals of the faces. I've recolored the model to match the reference images provided for me, as well as written the text on his hat with the Word Art tool in a Word processor program (because GIMP lacks blending tools required to make a good texture for font). Because the model was in .obj format, I actually had to make bones and rig the entire thing myself. That was when I realized the model isn't even symmetrical so I couldn't use the mirror weights functionality and had to rig both parts myself. As usual, I had a hard time with fingers to get to look right but I think you won't notice the imperfections in this image. The rest wasn't too bad to rig too I guess, except the mouth which was annoying like usual. This Luigi uses the Valve naming scheme, and his hat is also rigged to...give that bounciness when he runs I suppose? The Valve naming scheme is so he can have a working IK rig to use for Source Filmmaker. I've exported this Luigi as two smds and then ran it through a compiler. Since I was developing only for Source Filmmaker, I didn't need to make a collision model and joint constraints required for ragdoll creation and didn't write those in my .qc file. I also didn't make a .vta flex file, relying on the single mouth bone to pose for the scene. The .qc file was relatively simple, much simpler than my usual gmod fare due to the lack of ragdoll physics and the flexes. The same applies to his textures, which are also very basic .vmts since I don't think anything further is required. This was posed on an empty black map. I've wanted to pose in N64 Kongo Jungle, but alas I had no resources for that stage so it was omitted in favor of Temple. Temple actually isn't a map, it's a series of props, one for the stage and one for the skybox. This scene uses a total of 6 very large bright lights, as the props are large and require a lot of lights to fully light up the stage, as well as trying to imitate the lighting effects in my other pictures. I've used minimal post-processing and engine post effects such as vignette and very little bloom, as well as applying a small distance blur to focus on the image. 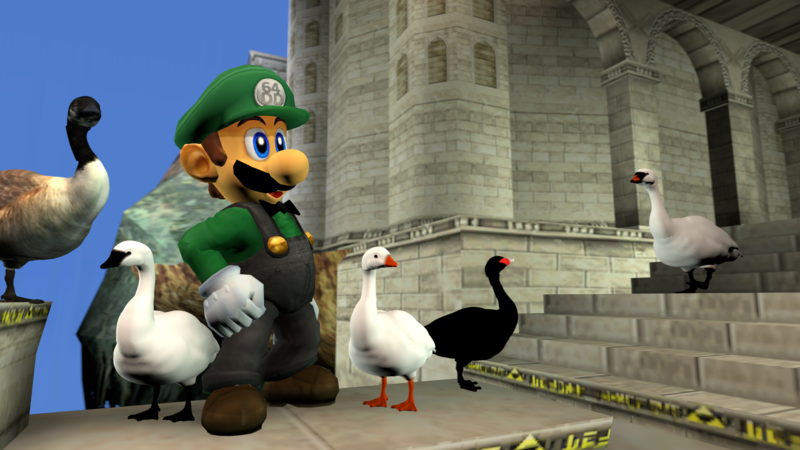 And of course, there's geese everywhere, as Luigi64DD is the goose man himself. I've extracted the geese from the Canada Goose pack from Garry's Mod, and put it in Source Filmmaker, and it works perfectly: in addition, I just threw in all the possible skins you can have for the geese, which is five total! They're not flying around, but perching next to Luigi64DD is good enough because they're close friends with him anyway (save for the one time Luigi64DD ate geese for Thanksgiving). The only other thing missing in this scene is a can or bottle of A&W root beer, which I sadly cannot find in either workshops. Very nice! Now let's tally your bonus points. You had a model that is sufficiently similar to N64 artwork Luigi, so that gives you bonus points. You also featured geese in the image, which gives you Super Duper Extra Bonus points. So adding it all together, your total comes up to Whopping Super Duper Extra Funky Nifty Fabulous Deluxe With Queso Sauce, A Small Milkshake, And 25% Off Your Next Purchase Bonus Points. In other words, I'm rather satisfied with this image. You captured a great image of me commiserating with my brethren. Thank you very much! Hah yes I could use that food to work on my next project...which WILL be a doozy but a nice challenge to spice things up.